Product information "Conductive silver screed (30 g)"
The conductive silver screed is perfect for reparation purposes. The paste can be filled into scratches and grooves and hardens when exposed to light. Daylight or artificial light are already enough. The highly conductive mass can then be grinded. By applying copper and nickel layers afterwards, it is possible to create a flawless surface. Additonal application fields: as liquid plumb to repair electric circuits and as highly conductive glue. Application: First degrease the surfaces thoroughly, then apply the conductive paste as thin as possible. Apply with a small spatula or a small stick. Let dry for at least 3 hours, but 24 hours are recommended. 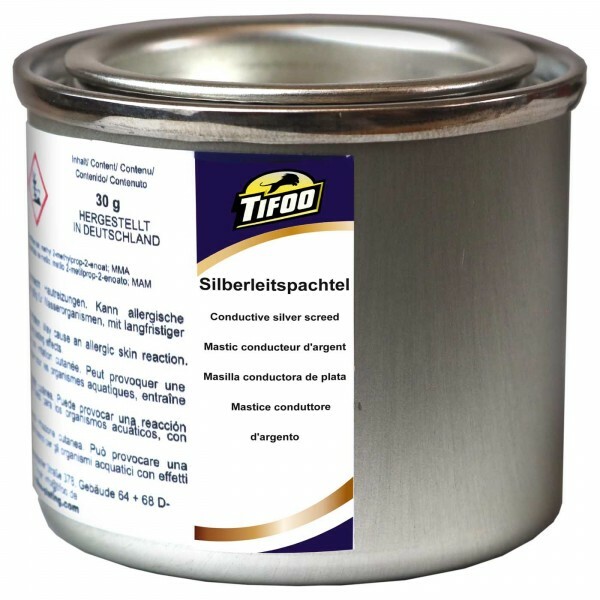 Related links to "Conductive silver screed (30 g)"
Instruction manual for Tifoo Conductive silver screed (30 g) as PDF file. Customer evaluation for "Conductive silver screed (30 g)"